Win A Free Rusido Guitar Capo Ukulele Capo Electric Guitar Monitoring… | FreebieOrBust Freebies! We have the most outstanding sweepstakes deals on offer online! Believe in yourself and seize the opportunity to win with us right now! 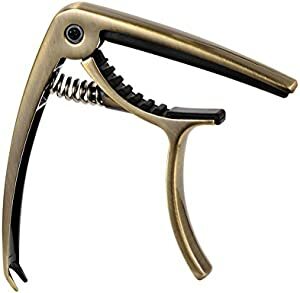 Rusido Guitar Capo Ukulele Capo Electric Guitar Monitoring Tuning C Lip Guitar Accessories Suitable for Ukulele Banjo and Mandolin Bronze. The chance of winning are 1:500. 30 prizes are currently available. Offer hosted by Amazon and Rusido. Sweepstake Ends: 4/22 at 11:59 PM PDT or when all prizes have been awarded. There are 30 prizes to win. Every new member has instant access to realize their dream of winning! Every month, we make thousands of our subscriber’s winners. All you need to do to be part of the party – is register and keep checking back.